The tea packaging machine bag system adopts stepper motor subdivision technology, which has high precision in making bags with an error of less than 1 mm. The tea packaging machine uses a temperature controller to make the seal higher quality. 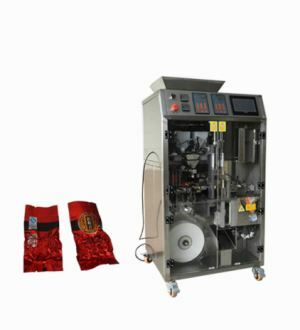 Full-automatic tea packaging machine micro-computer bag length controller, which can set the length of the bag without replacing the parts, and can be pre-counted, showing the packaging speed, bag length and so on. Fully automatic PLC/touch screen programming control to make performance more stable, simpler operation and more humanized. Fully automatic All parts in contact with the material are stainless steel. Previous: What Are The Advantages Of Particle Packaging Machine? Next: How To Maintain The Vacuum Packaging Machine?